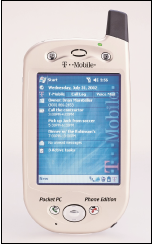 HTC's T-Mobile Pocket PC Phone Edition was technically the first 3.5-inch touch screen phone in the United States in 2002. Remember the HTC O2 XDA? Neither do we, but just for the record, HTC would like to remind you that it was the first 3.5-inch color touch screen phone in the world when it launched back in 2002. You know, in case Apple wants to get all technical about who did what first. So goes the company’s official response to Apple’s recent lawsuit, which HTC published Wednesday in a press release aptly named “HTC disagrees with Apple’s actions.” Although the company makes no attempt to pick a legal fight with Apple over the XDA or any other phones, it makes the case for many of HTC’s own innovative “firsts,” including the first Windows PDA in 1998, the first Windows phone in 2002, and the first gesture-based smartphone in 2007. Apple’s lawsuit against HTC invokes 20 patents, including those for CPU undervolting, object-oriented graphics, techniques for unlocking a touch screen, and multi-touch gesture control. HTC responded that it was shocked and caught off guard by the case immediately following its public announcement. Now it’s also prepared to fight back. A legal battle between the two companies could easily take in excess of a year, but a separate complaint with the U.S. International Trade Commission – which typically moves much faster than courts – could block the importation of allegedly infringing HTC devices sooner, if Apple is successful.